I posted this picture in yesterday's blog, but it really is special to me. I have a friend who lives a long, long drive away from me. We have been friends since we were in Girl Scouts, but we haven't lived near to each other for years. She has had this Kit for a long long, but due to space constraints, Kit had to live in a box and I only "met" Kit once. I was so happy at this visit that Kit was sitting out where I could see her. 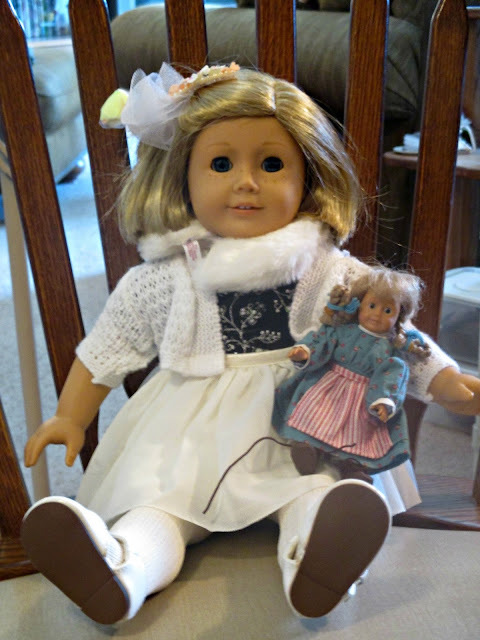 It was the first time that two of our dolls got to meet each other. I kind of wished that I had brought one of my full-sized dolls, but Kit sometimes dresses up and pretends to be Kirsten, so it was a serendipitous choice in that regard!